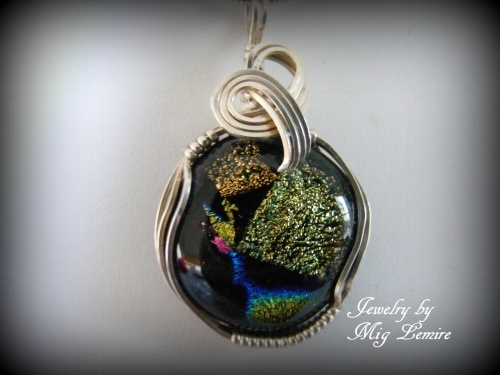 This pretty handmade dichroic glass pendant is the so colorful with blues, greens, pinks and golds and black along with more colors. Piece will match any outfit for sure. Sculpted with sterling silver curls, making it one of a kind. Measures 1 1/2" long from top to bottom and 3/4" wide. Comes with a sterling silver snake chain.